Hello everyone, Darcy here with the introduction of our latest topic. As you are probably aware, when we start a new round of topics they come in bundles of 4, and the first of those is always colour based. As we are rocking a bit of a Christmas vibe here of late, we thought it made sense to look at metallic as the colour-theme for the next 2 weeks. Metallic colours have been a huge influence on decor, fashion, clothing, makeup and even nails in the last couple of years, so it's a pretty hot theme. We seem to have moved away from the stark values of Silver and Gold into softer tones of rose gold, platinum, bronze, and also fun colours such as these beads below. 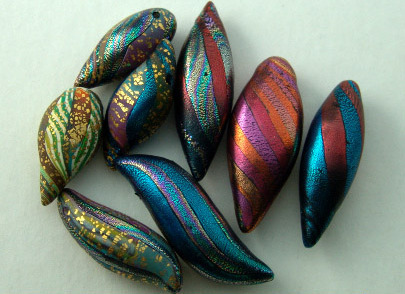 They are polymer clay covered in coloured metallic foil. Anything that is metal or has the appearance of a polished metal can be termed as metallic, generally these items are always shiny. Solid blocks of pigments cannot be metallic alone, they need to be mixed with metal powders or flakes, these reflect the light and generate the 'shine'. The use of metals is not new, the origins of metal pigments goes back to the ancient art of 'gold beating' it was early Egyptians that would work gold into super fine sheets, these were then used to overlay other substrates such as wood or bone. As demand grew the sheets became thinner and thinner, this resulted in the edges breaking off. These 'flakes' were then mixed with binders so that they could be used. They also rubbed the gold through a fine mesh to create gold powder, this was then used in inks. Over the years of course cheaper metals were introduced and also metal substitutes. We even have metallic pens now. Here is a great comparison sheet. 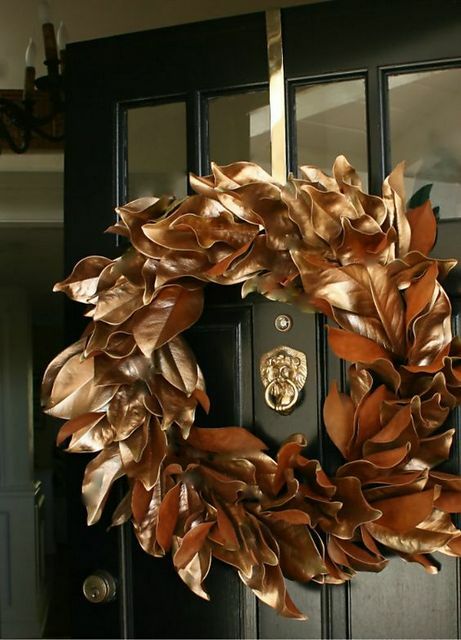 Metals can be added to any substrate in one form or another, by painting, gilding, waxing, leafing or even stitching. For centuries precious metals have been made into threads to use in embroidery and on clothing. 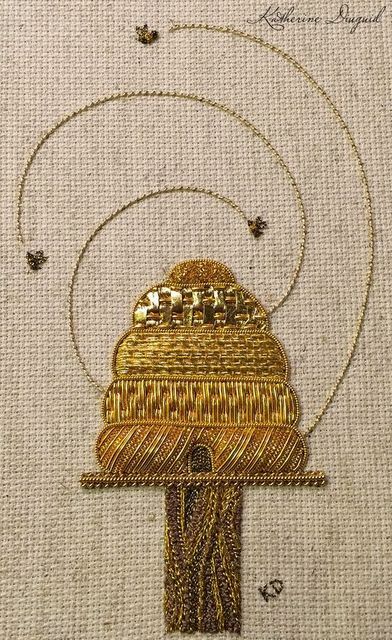 Just look at this delicate piece of goldwork. 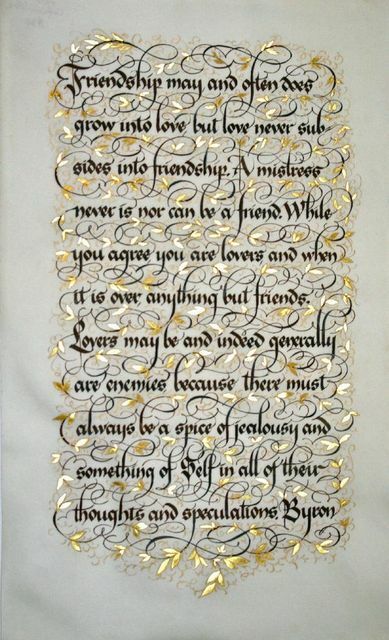 This beautiful piece of calligraphy is walnut ink and gold leafing, if you don't fancy tackling something so intricate you could stamp out some text and paint leaves with gold paint. Remember though that metallic paints contain metal flakes or powder, this is usually heavier than the binder and will nearly always sink in the bottle, no matter the brand. So always give your metallic paints a good shake. 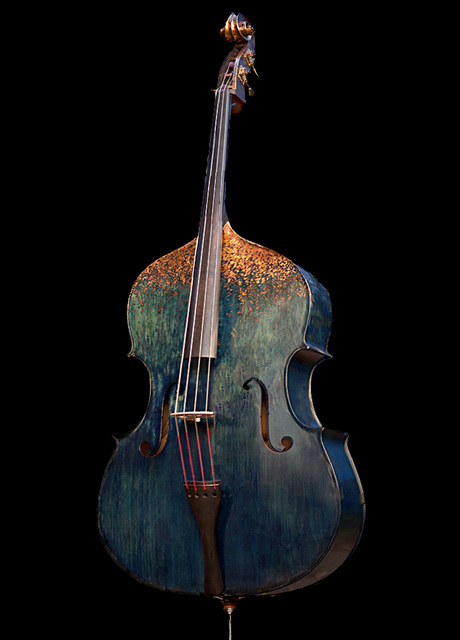 Something you might not expect to see decorated is a double bass. I just love this, and while I don't play at all i would love this as a statement piece of art in a room. This was rescued from a fire, renovated and given its copper leafing decoration. A seasonal one now. this would be a perfect autumnal wreath but also for Christmas too, simple but so effective, this wreath is coloured using spray paint. A couple of coats using very light strokes will give a beautiful even finish. 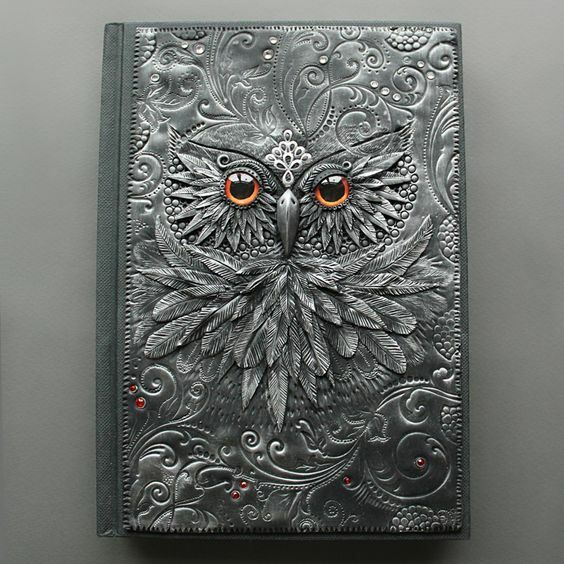 Another polymer clay piece now, how utterly amazing is this book cover, so detailed and striking. As you can see this product takes paint and gilding really well. 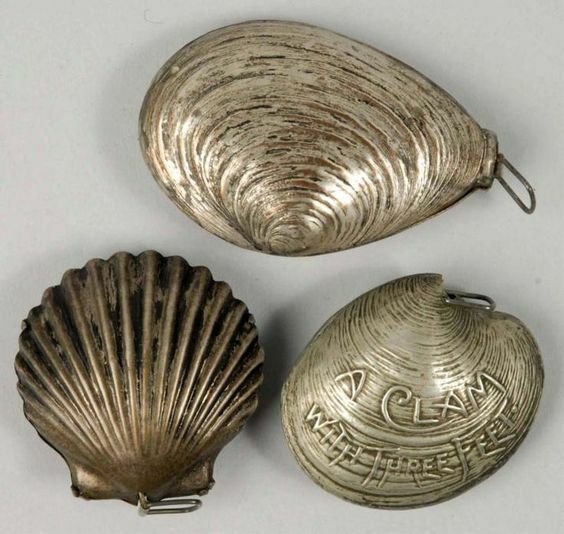 These look like real shells, but they are made from metal, they also have hidden tape measures inside. They are vintage now, but you can still find odd ones for sale. Could you make something like this? perhaps papier mache? painted and gilded with Treasure Gold and you would have a wonderful case for a tape measure. 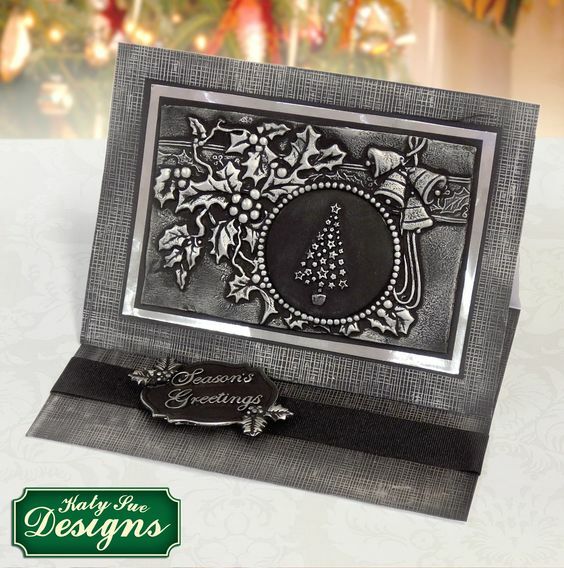 A few years ago, metal embossing was all the rage, did you have a go at it, did you buy all the tools? why not dig them out and have another go. if you like the idea of metal embossing and shaping then pop on over to our very own Lin Brown's blog, there you will see some tutorials to make flowers like this one. Here Leandra shows you how to use PaperArtsy stamps and dies to create a metal flower. A simple shape can be transformed by making it shiny, this chipboard heart is covered with mirrored card, then 'grunged up', any size or shape would work with this. Perhaps cut out letters of a name for a child's bedroom. This could look quite industrial, and would be perfect for a boys room. 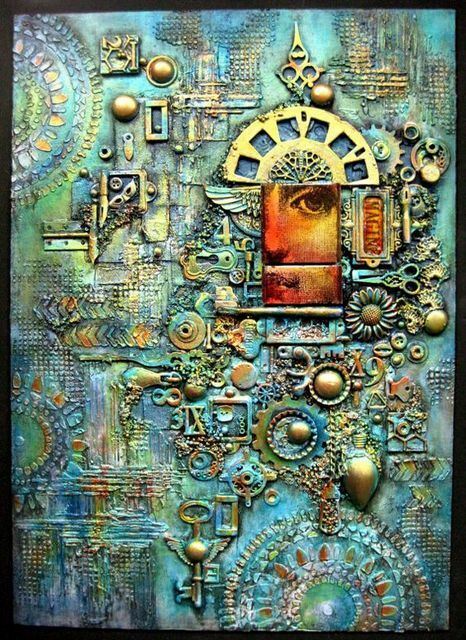 This mixed media piece is jam packed with metallic goodies, from the background paints to the gilding on the raised textures and the fabulous array of embellishments. 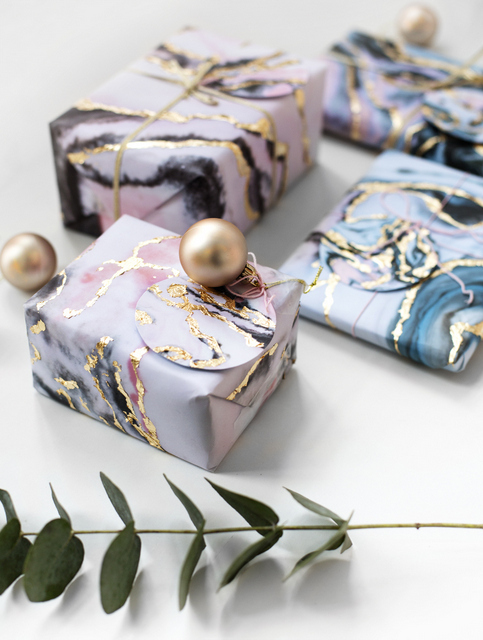 As the festive season is coming how about getting a head start on your wrapping paper, first use your PaperArtsy Fresco paints to create marbling, and then add some gold leaf to add sparkle. 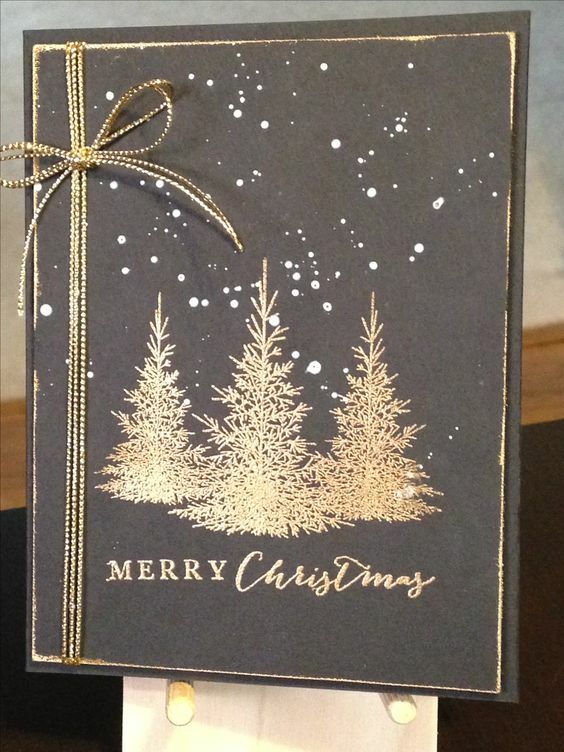 Once you have your gift wrap then you can make a start on your cards. 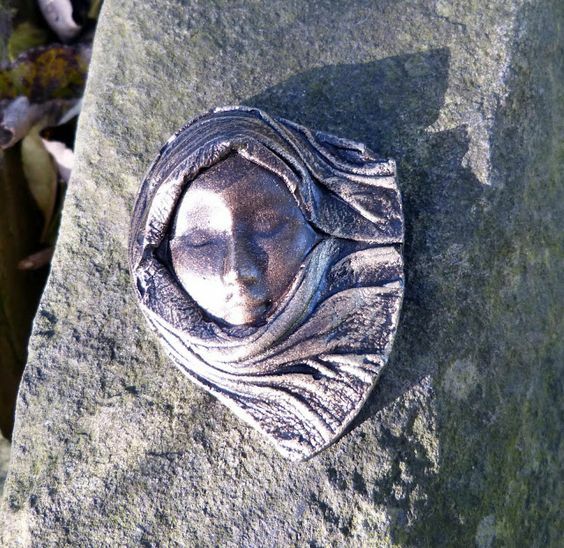 This one is made with a mould using paper clay then painted and gilded to give it that subtle metal finish. This one employs embossing powders, we all have those in a drawer, time to get them out and create some magic. Have you tried making your own embellishments? it really is so easy with so many products now available, there are moulds of every conceivable shape these days. they can be filled with clay, or paper clay, or hot glue, gel or UTEE. Once your embellishment is fully set it can be coloured and turned metallic by using PaperArtsy fabulous Treasure Gold. Here Leandra shows how the beautiful colours of Treasure Gold all combine to give a metallic finish that is soft and delicate. 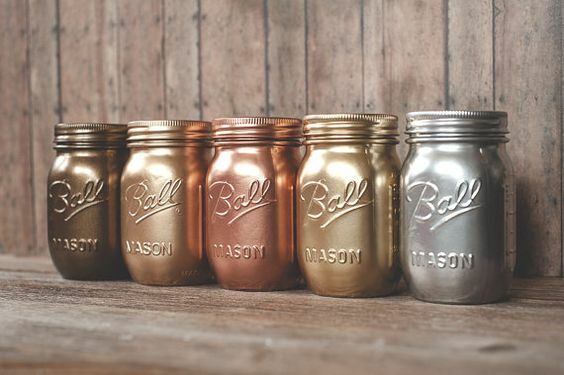 Here are a few more ideas to bling up your home with a little metallic shine. Painted storage jars for a modern twist on vintage jars. 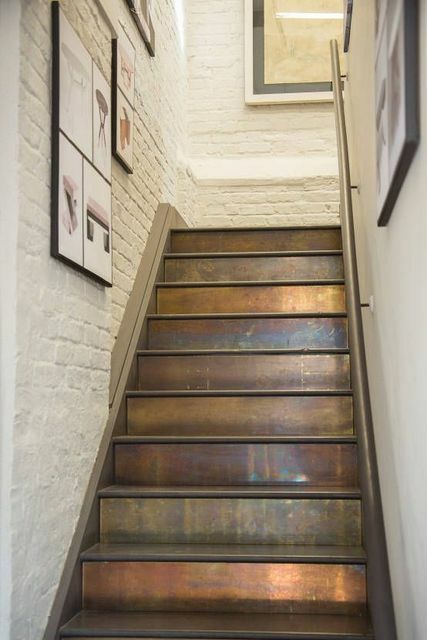 Or what about this fab staircase with patinated brass cladding. 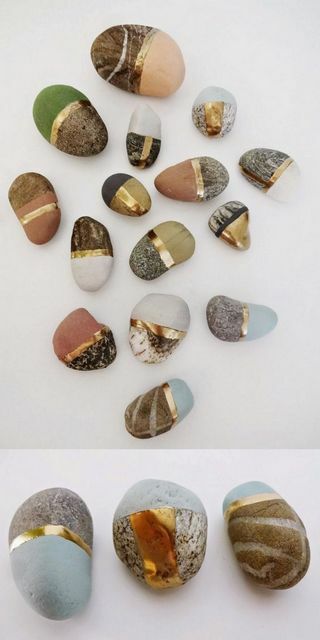 Or how about these painted stones, PaperArtsy chalk paint will work beautifully on stones and you can colour match them to any room decor. 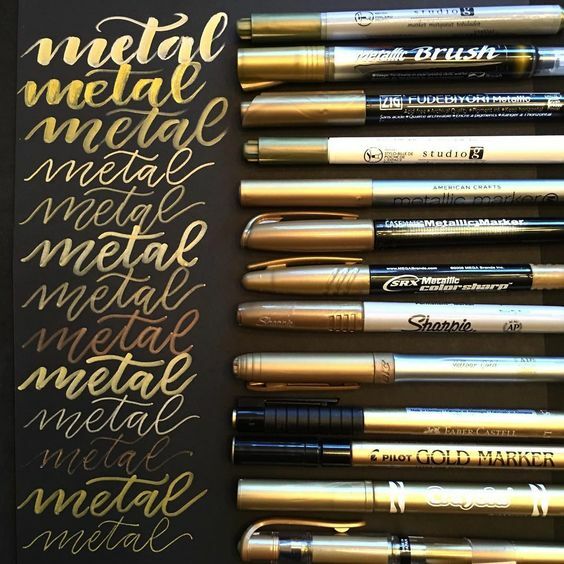 These are just a few examples of metallic art, over the next two weeks our guest designers will have even more fabulous creations for you, to inspire and excite and hopefully get you reaching for your stash. The current topic link will close 17:00 (London Time) Sunday, October 1st 2017, and the winner will be announced 2 hours later at 19:00.
what a fab topic and such varied use of metallic colours/objects. Gorgeous examples - I love the staircase - for a terrific challlenge topic. So many ways to get shine on our projects... PA Treasure gold is one of my favourite products for gilding, so easy to use and it doesn't dry in the pot. I'm looking forward to this fortnight! And Darcy, what a fabulous post! Wow, what an inspiring post!!! Great topic! I love metallics! I fell in love with the stones! Fabulous intro as always Darcy and what a fab topic. I really must make time to have a go for this challenge as I love working with anything metallic. What a brilliant and inspiring intro! Thanks, Darcy! 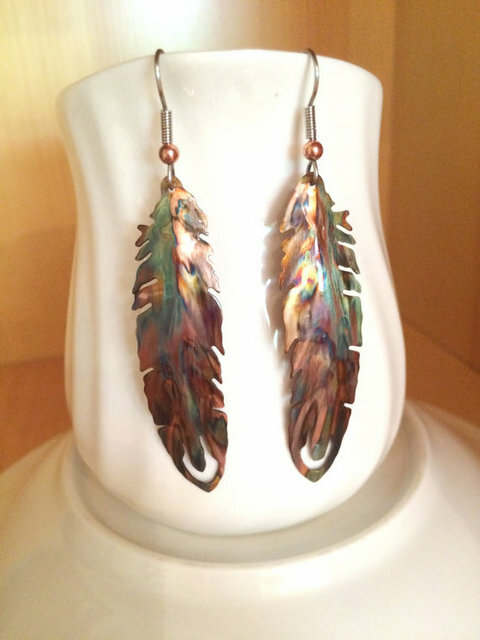 Gorgeous inspiration and my favorite is the piece by the wonderfully talented Sanda Reynolds! Incredible really!